Dental disease in dogs and cats is extremely common and insidious. Left untreated, dental disorders can lead to inflammation, infection, abscesses, and ultimately tooth loss, all the while causing discomfort for the pet. Also, oral infections can spread to other organs and cause significant problems distant to the mouth. The best way to prevent this cascade of complications is with daily brushing and regular check-ups. At Streetsville Animal Hospital, every examination includes a thorough oral exam to check for any problems that may need attention. We routinely demonstrate the proper method to provide home care for your pet’s teeth. There are certain techniques and tips that will allow most owners the ability to do this for their pets. Home care is the most important thing you can do at home to help prevent serious dental issues from developing in your pet. At Streetsville Animal Hospital, when dental disease progresses to the point that is has to be addressed in hospital, a day is booked for your pet’s complete oral health assessment under anaesthetic. The safest and shortest acting anaesthetics are used after first confirming your pets health with another thorough physical exam on the day of the procedure, and evaluation of any required pre-anaesthetic blood tests. All surfaces of the teeth gums and surrounding structures are fully evaluated during the oral assessment and cleaning. Tarter is removed from all surfaces of the teeth. They are then polished and a fluoride paste is applied. Any complications that are discovered during this stage of the procedure are noted and you will be called with Dr. Todd’s recommendations. All are dental cleanings involve digital dental x-rays that allow us detect any abnormal problems in the roots of the teeth hidden out of site under the gum line. 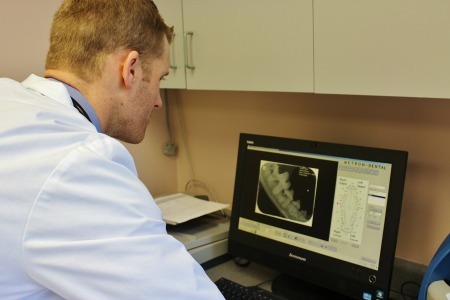 These X-rays also allow us to evaluate the viability of teeth to determine the extent of the problem. If possible options for treatment will be discussed and we will arrive at a mutual decision regarding the best treatment for your pet. When your pet is discharged that night, we will thoroughly review the procedure with you. We will also discuss any medicines being dispensed. We will review what to expect that night and the following day, and what to look for if complications develop. Dr. Todd has been evaluating and treating dental disease in pets for numerous years. You can trust his expertise to assist in helping you prevent serious dental issues from developing, and managing them if they do arise.